The Sunday preceding her death, I went to Her Majesty after church to present her with the portrait that I had made of the Grand Duchess Elisabeth. She congratulated me upon my work and then said: “They insist that you must take my portrait. I am very old, but still, as they all wish it, I will give you the first sitting this day week.” The following Thursday she did not ring at nine o’clock as was her wont. The servants waited until ten o’clock, and even a little later. At last the head maid went in. Not seeing the Empress in her room, she went to the clothes-closet, and no sooner did she open the door than Catherine’s body fell upon the floor. It was impossible to discover at what hour the apoplectic shock had touched her; however, her pulse was still beating, and hope was not entirely given up. Never in my days did I see such lively alarm spread so generally. For my part I was so seized with pain and terror when apprised of the dreadful tidings that my convalescing daughter, perceiving my state of prostration, became again ill.
After dinner I hastened to Princess Dolgoruki’s, whither Count Cobentzel brought us the news every ten minutes from the palace. Our anxiety continued to grow, and was unbearable for everybody, since not only did the nation worship Catherine, but it had an awful dread of being governed by Paul. Toward evening Paul arrived from a place near St. Petersburg, where he lived most of the time. When he saw his mother lying senseless, nature for a moment asserted her rights; he approached the Empress, kissed her hand, and shed some tears. 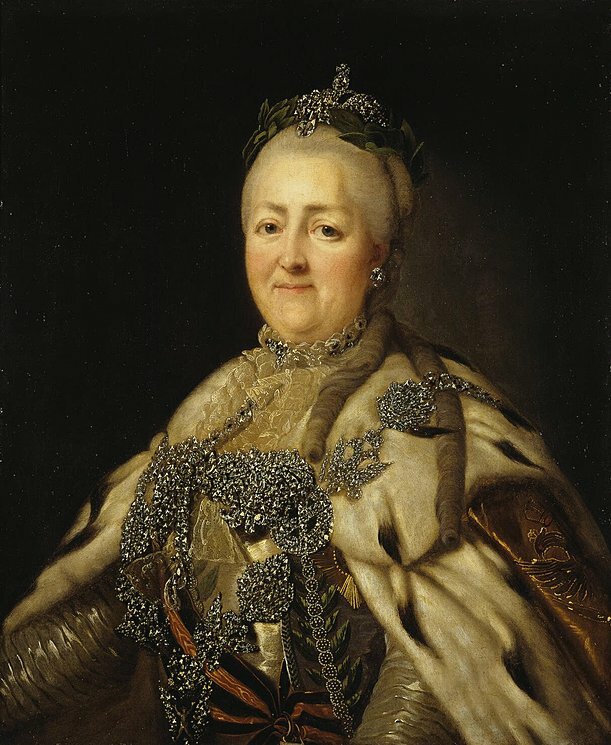 Catherine II. finally expired at nine o’clock on the evening of November 17, 1796. Count Cobentzel who saw her breathe her last sigh, at once came to inform us that she had ceased to live. I confess that I did not leave Princess Dolgoruki’s devoid of fear, in view of the general talk as to a probable revolution against Paul. The immense mob I saw on my way home in the palace square by no means tended to comfort me; nevertheless, all those people were so quiet that I soon concluded, and rightly, we had nothing to fear for the moment. The next morning the populace gathered again at the same place, giving vent to its grief under Catherine’s windows in heartrending cries. Old men and young, as well as children, called to their “matusha” (little mother), and between their sobs lamented that they had lost everything. This day was the more depressing as it augured so sadly for the Prince succeeding to the throne. The Empress’s body was exposed six weeks in a large room at the palace, lit up day and night and gorgeously decorated. Catherine was laid out on a bed of state and surrounded by shields bearing the arms of all the towns in the empire. Her face was uncovered, her beautiful hand resting on the bed. All the ladies – of whom some took turn in watching by the body – bent to kiss that hand, or pretended to. I, who had never kissed it in her lifetime, did not dare to kiss it now, and even avoided looking at Catherine’s face, which would have left too bad an impression on my memory. After his mother’s death, Paul at once had his father Peter disinterred; he had been buried for thirty-five years in the convent of Alexander Nevski. Nothing was found in the coffin but bones and a sleeve of Peter’s uniform. Paul desired the same honours rendered to these remains as to Catherine’s. 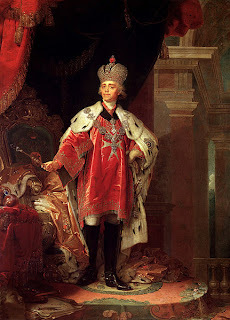 He had them exhibited in the middle of the Church at Kazan; the watch service was performed by old officers, friends of Peter III, whom his son had pressed to come, and whom he loaded with honours. The day of the funeral having arrived, Peter III.’s coffin, on which his son had placed a crown, was put with great ceremony beside Catherine’s, and both were conveyed to the Citadel, Peter’s preceding, it being Paul’s wish to humble his mother’s ashes. I saw the marvellous procession from my window as one sees a play from a box in the theatre. Before the Emperor’s coffin rode a horseman of the guard, clad from top to toe in golden armour; but the man riding in front of the Empress’s coffin wore only steel armour. The murderers of Peter III. were, by order of his son, obliged to act as pall-bearers. The new Emperor walked in the procession on foot, bareheaded, with his wife and the whole court, which was very numerous, and attired in deep mourning. The women wore long trains and enormous black veils. 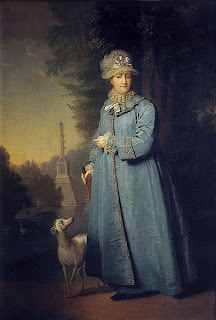 They were obliged to walk in the snow, at a very low temperature, from the palace to the fortress, where Russia’s sovereigns were laid to rest, a long distance on the other side of the Neva. Mourning was ordered for six months. The women’s hair was brushed back, and their headgear came to a point on the forehead, which did not improve their looks at all. But this slight inconvenience was insignificant compared to the deep anxiety to which the Empress’s death gave rise throughout the whole empire.